What is Omakase and is it for you? Do you suffer from “SMI”? Severe Menu Indecision is a common condition affecting many of us. Do you stare at a restaurant menu, for what feels like hours, trying to decide what to order? I do. No, not because I’m picky. On the contrary, I’m not picky at all. I will eat just about anything on a menu. I love food! The challenge is most restaurant menus have so many choices, in an attempt to please every palate, and everything looks good to me. Thus, leaving the poor hungry souls suffering from SMI, like me, sitting there reading through descriptions, drooling, delaying our dining companions orders, while trying to decide between this or that or that other one? I often wish I could just order everything on the menu, but then I would probably eat everything, and that would not be wise, would it? Recently, while dining at Dragonfly Orlando, I found the perfect solution for Severe Menu Indecision. Just RELAX. Let the chef decide for me. Dining at the chef’s whim is called Omakase in Japanese. It literally means to trust the chef. All you have to do is give the chef some cues as to your dietary restrictions or preferences and then let them do what they do best. Create a culinary masterpiece. Thus, leaving you free to enjoy the table conversation, as opposed to pretending to listen, while actually trying to decide your order. Problem solved. No more Severe Menu Indecision! Sushi chefs are culinary artists with extensive training. Sushi quality is not only determined by the freshness of the fish and cooking the rice to perfection but also by the artistry of the presentation. The Omakase menu option allows a chef to truly shine by giving him full freedom to serve you the very best. Not only are they using some of the freshest seafood in the restaurant that day, but their superb knife skills lead them to create plates so gorgeous you may just want to stare in awe. 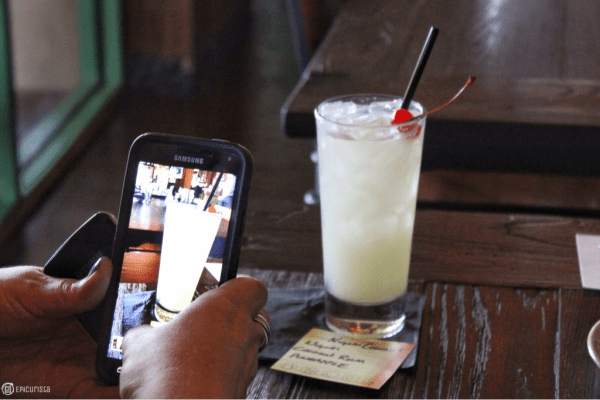 You definitely have to take a picture – or 20 in my case. Let’s take a picture first! Typically, the Omakase menu will consist of a variety of dishes, served from lightest to heaviest, with raw, grilled or simmered options. It can be a feast of as many courses as you choose and your pocket will allow. Everyone should Omakase, so why don’t they? Omakase is offered in Japanese restaurants all over the world, especially those on the higher end of the price scale, where Omakase menus can be all night feasts of multiple courses, reaching the neighborhood of $400 per person (Urasawa in Los Angeles) and even higher. Yikes. Obviously, those prices aren’t for everyone. There’s also the trust factor. I don’t understand the hesitation to trust the chef, yet, so many diners kill the kitchen with special requests and substitutions resulting in a dish that is nowhere near what the chef originally intended. This is the opposite of Omakase. Here’s food for thought. If you’re eating in a chef’s restaurant you’ve already placed your dining experience in their hands, why not take it a step further, and actually trust them and let them surprise you? Certainly, the chef knows his product and what he does better than anyone. With Omakase, you let the chef know your dining preferences such as “no sea urchin” or “I’m allergic to avocado” and then you sit back, relax and get ready for a feast. There is no substitutions and no giving direction to the chef on what you want or how to prepare it. Just sit back and relax. There’s another component of trust that plays a big part in traditional Omakase. Typically this feast is geared towards regular patrons where the chef knows the guest’s palate and the guest knows the chef’s skills. 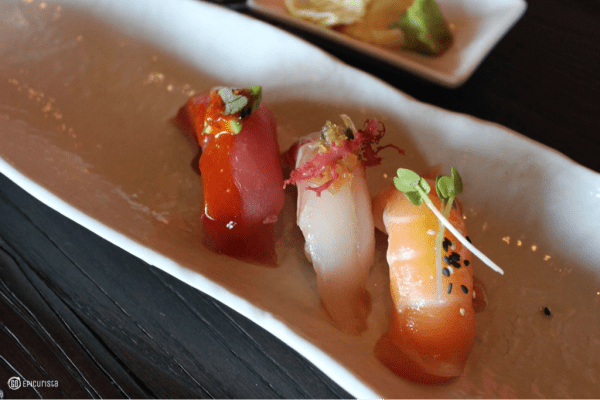 Omakase is not typically something you order on a first visit to a restaurant, thus out-of-town visitors must be adventurous to Omakase in a restaurant they’ve never been to. Thankfully, we now have online reviews to help in the decision-making process. Omakase menus have the reputation of being out of reach for the general population, only enjoyed by the adventurous foodie, the wealthy, the frequent diner, or all of the above. Is there another way to Omakase? I think so. 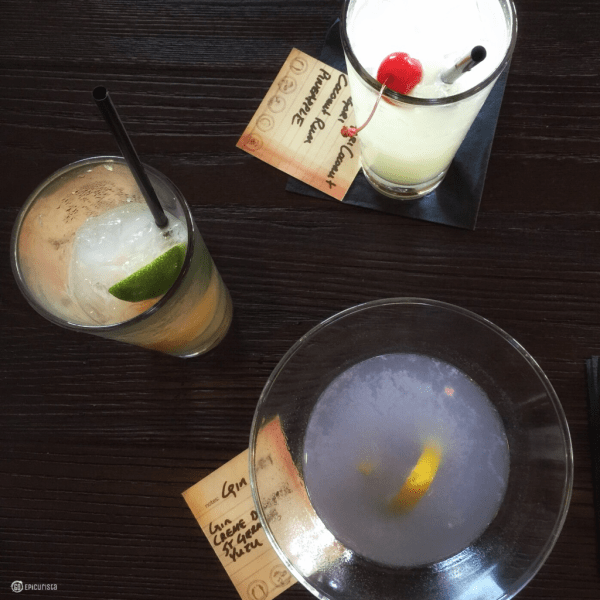 Dragonfly Robata Grill & Sushi in Orlando has been on my Orlando Favorites List for a long time, especially for offering a fantastic Happy Hour, which I placed on Go Epicurista’s Top 9 Happy Hour for Foodies in Orlando. Their cocktail selection is creative, appropriately themed and the perfect pairing to some of the best sushi in town. When I heard they were introducing an Omakase Menu concept to offer guests the opportunity to simply order based on their mood and then let the chef decide the meal using seasonal ingredients, I was excited to try it. 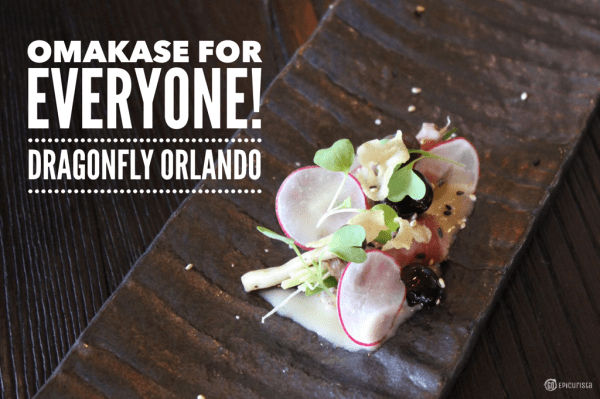 Could this be an approachable Omakase experience that didn’t require a gold mine or a frequent diner card?” Omakase for Everyone at Dragonfly Orlando! Their “Think Less. Eat Well.” Seasonal Omakase menu encourages you to select a mood and an ingredient and then trust the chef to craft a dish based on that taste profile. 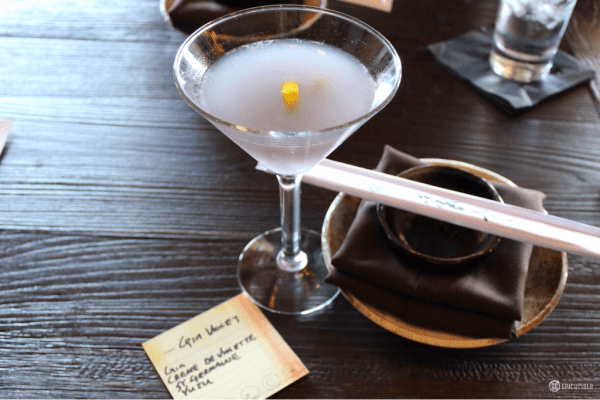 They took the Omakase concept even further and applied it to the bar, allowing bartenders to create a cocktail also based on your taste preference. Genius! This is a great way to ease less adventurous diners into the Omakase concept since you know what the main ingredient of your drink or dish will be, you just don’t know the other components or the presentation. It is also perfect for our many Orlando visitors that may be dining at Dragonfly for the first time and thus don’t have an established relationship with the chef as a regular diner would. 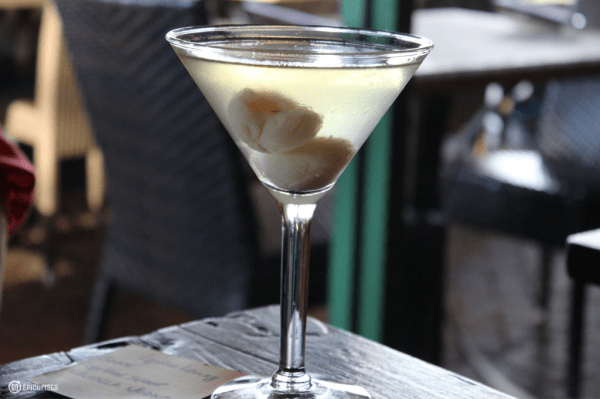 Dragonfly is conveniently located on Sand Lake Road, near the attractions and the Orlando convention center, making it a popular dining destination for visitors and locals. Lastly, the Omakase pricing at Dragonfly Orlando is very approachable, with entrees averaging $20-24 each and sushi roll selections in the $9 -$18 for example. If you want a $400 per person menu, I’m certain they would be happy to accommodate but no need to break out the Black Amex here. For these reasons, I say Omakase for everyone at Dragonfly Orlando. 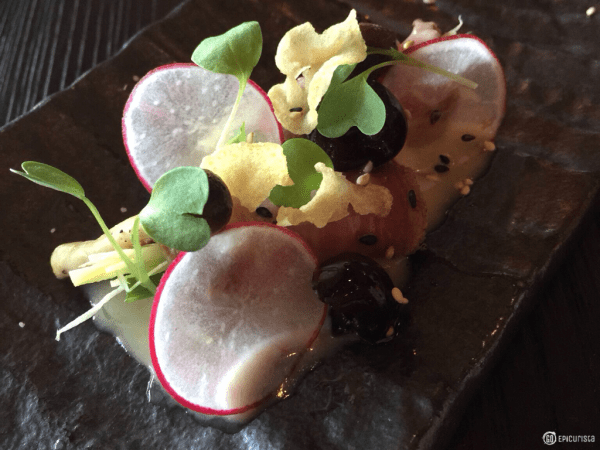 Is this traditional Omakase at Dragonfly Orlando? No. It is an Omakase interpretation that would suit everyone. When you see the menu I sampled below, I’m fairly certain you will agree. I visited with some media friends and we sampled a variety of cocktails and dishes to get a taste of the full Omakase style offerings. The menu is very approachable and creative with wonderful combinations of flavors and textures. It is definitely Omakase for everyone, as long as you like fantastic food and can relax and let the chef and bartender decide for you. I was more than happy to let them take that pressure off and just eat and drink what was put in front of me! Let’s start with the drinks. 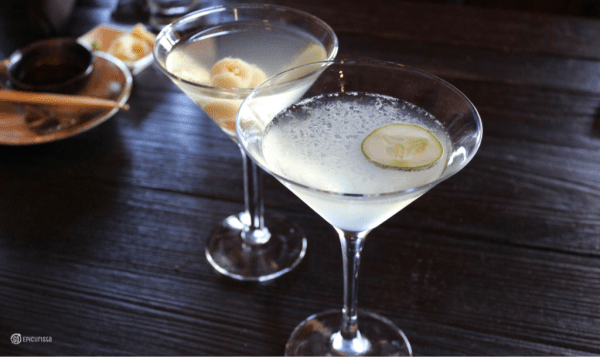 In addition to the traditional full bar, you will find a variety of cocktails at Dragonfly using Japanese spirits such as Sake and Shochu blended with fresh juices and house-made mixers. The Omakase menu guides you to order based on moods like Floral, Refreshing, Tropical, Soothing or Sweet. A cocktail to suit your mood! I began this degustation in the Floral mood with a Gin Violet Cocktail made with gin, Creme de Violette, St. Germain Elderflower Liqueur, and Yuzu. This was not your grandmother’s cocktail. It had lovely floral notes and a gorgeous lavender hue without being too perfumey. It reminded me of a Spring garden party. 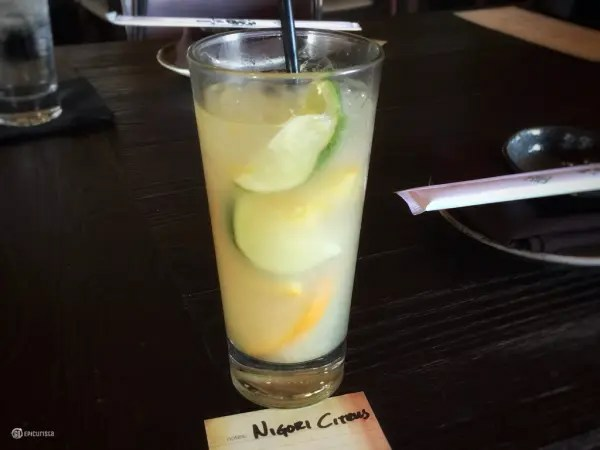 If you’re in a Refreshing Mood and you love Citrus, the Nigori Citrus Cocktail with fresh limes, oranges, Nigori Sake, an unfiltered sake with a sweeter and fruity taste, Shochu, a distilled rice spirit similar to vodka, and orange gastrique was light, vibrant and fun. Florida in a glass! 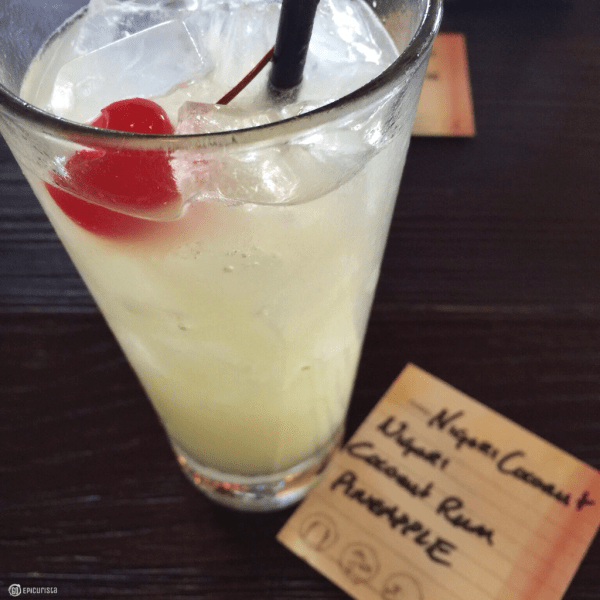 If you’re a fan of Piña Coladas but want something lighter and less caloric, the Nigori Coconut Cocktail with Nigori sake, coconut rum and pineapple juice can induce dreams of a tropical vacation. A perfect Summer cocktail! Lychee Martini made with sake, lychee syrup and vanilla vodka, garnished with whole lychee fruit was sweet yet well-balanced. I’m not sure what mood category this cocktail fell in as one of my dining companions just told the server to have the bartender surprise her, and he did! To end the night, I went the Soothing route and asked the bartender to surprise me. He delivered with a Cucumber martini that had me imagining a trip to the spa in my near future. Cucumber Compulsion Cocktail made with Cucumber Vodka, St. Germain Elderflower Liqueur and Fresh Lemon Juice was definitely a Zen moment I enjoyed. 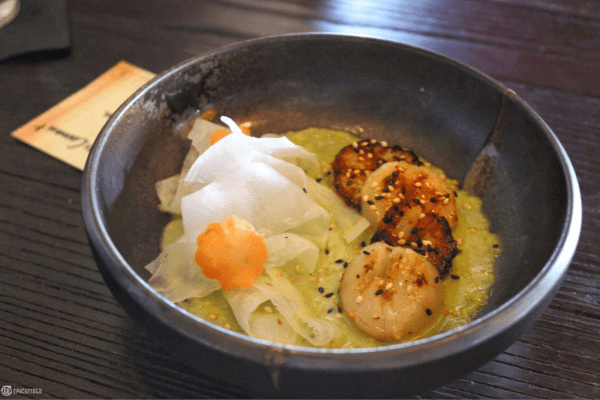 For a Spicy mood, the Hokkaido Scallops with garlic jalapeño sauce, carrot and daikon salad hit the spot. I loved the touch of heat from the pepper without overwhelming the delicate sweetness of the scallops. What a pretty way to start a meal. Omakase and I’m feeling good. Feeling Savory? The Snake River Farm Wagyu with Shemiji mushroom, radish, maraschino cherries, yuzu truffle butter, crispy garlic and scallions was a great bite. The truffle butter gave it a wonderful umami while the radish and cherries were a nice contrasting surprise. Pure chef artistry. I could have eaten lots more of these beautiful beef creations but we had more dishes to try. The Chilean Sea Bass with miso karashi, eringi puree, heirloom carrots and honey soy was their Earthy mood representation and it was fantastic. 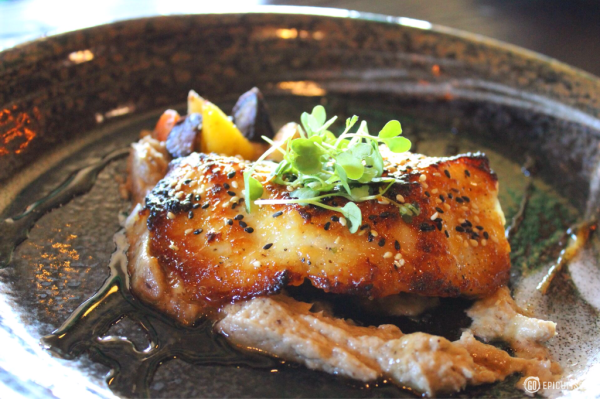 The buttery fleshy fish combined with the eringi puree, a type of oyster mushroom, gave it the earthiness required. The fish was cooked perfectly and was a favorite of everyone at the table. The beautiful golden color from the honey soy glaze was enough to make us all ‘ooh’ and ‘aah’. You can’t dine at Dragonfly and not sample their amazing sushi selection. Our next course was the Composed Nigiri of Loch Duart salmon, Big Eye tuna and yellowtail. This course was Omakase worthy! The fish was wonderfully fresh as it’s flown in daily from Japan and the garnishes and sauces gave it that added touch that elevated their flavors. There was no need to drown these beauties in soy sauce. In a nod to one of my favorite 1980’s movies, The Karate Kid, our next course was one of the restaurant’s signature rolls. 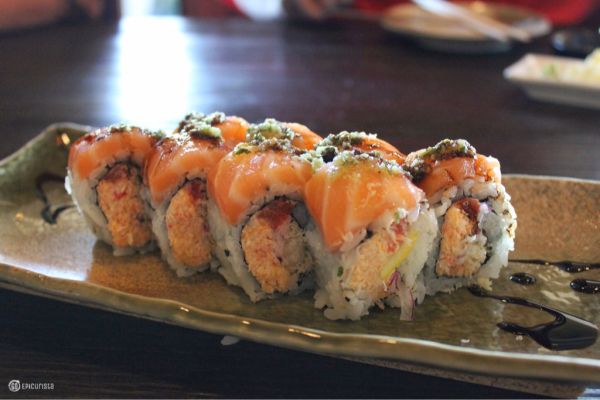 The Cobra Kai Roll had a great combination of flavors and textures with snow crab delight, red onion, tomato, tempura flakes and lemon slices, topped with Loch Duart salmon, finished with garlic-shiso pesto and aged balsamic. The garlic-shiso pesto gave it a wonderful vibrancy. I love the use of fresh herbs. There was no pow and plenty of wow! Another dish I happily devoured and an example of how the Omakase selections can be combined with their regular menu selections for a tasting menu to suit your tastes. 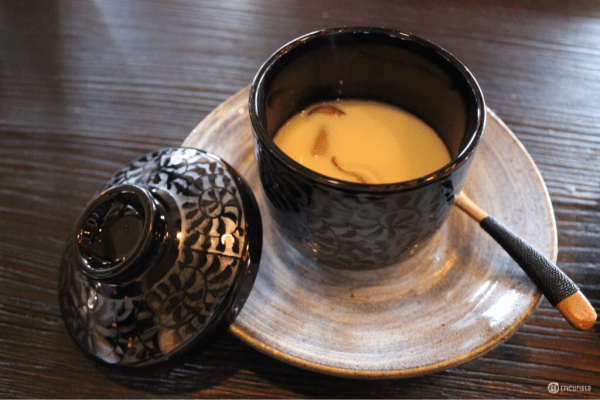 Next we were presented with a traditional Japanese dish called Chawanmushi, a savory egg custard steamed in a tea cup, with shrimp and mushrooms, flavored with soy sauce. This is where Omakase truly kicks in. I would have never ordered this dish on my own and I’m so glad the chef chose it for us. I love trying new dishes. It was flavorful and soothing, like comfort food. It served as a palate cleanser after all the variety of flavors we had experienced. The last mood of the evening is always my favorite, Sweet. The key ingredient offered was chocolate with a decadent Chocolate Pot de Creme served with lychee ice cream, strawberry jam and walnut biscotti. It was the perfect sweet ending to a beautiful Omakase dining experience. I must note that the dishes and cocktails featured above are a representation of what you can expect in terms of quality, variety and presentation, however, the concept of Omakase allows the chef to use seasonal ingredients and be creative. So expect to be surprised. After this dining experience, I was hooked on the idea of Omakase. I would love it if every restaurant chef offered this, not just Japanese restaurants. Spanish Tapas comes close which is why I love that style of dining. 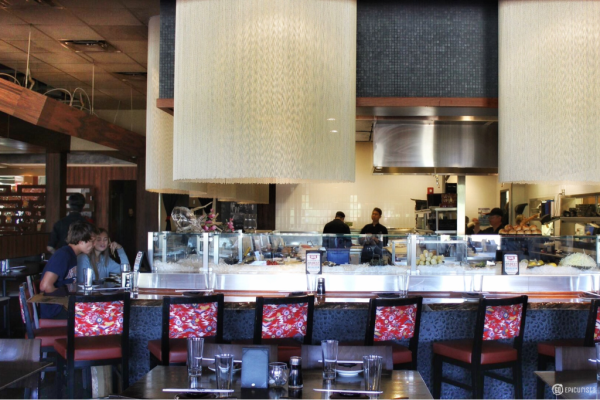 Dragonfly incorporates the small plates concept with their sushi, sashimi and robata open fire grill creations. Dragonfly Orlando has made Omakase approachable for everyone to enjoy. It doesn’t completely take the decision-making out of your hands rather it gently guides you to a truly creative experience that you may not have had otherwise. Is Omakase for you? That depends. If you’re a “California or Spicy Tuna Roll only” kind of person then maybe not. You must be willing to trust the chef and be tiny bit adventurous. I encourage you to let loose, live a little and GO Omakase. Omakase is definitely the cure for SMI. GO eradicate Severe Menu Indecision forever! Dragonfly Orlando is located in the Dellagio shopping center, 7972 Via Dellagio Way, Orlando. They have a comfortable patio, lounge and expansive restaurant with an open kitchen where you can sit and watch the chef’s in action. 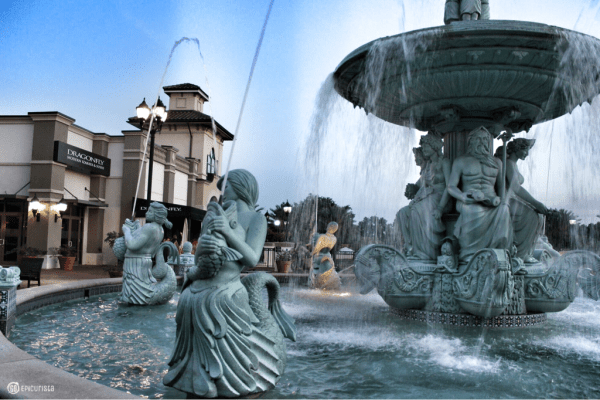 After your dinner, stroll around the plaza and enjoy this beautiful fountain. Disclosure: We were guests of Dragonfly as part of a media dinner, however, that in no way influenced my opinion as I only share with you experiences worth celebrating. Cheers! 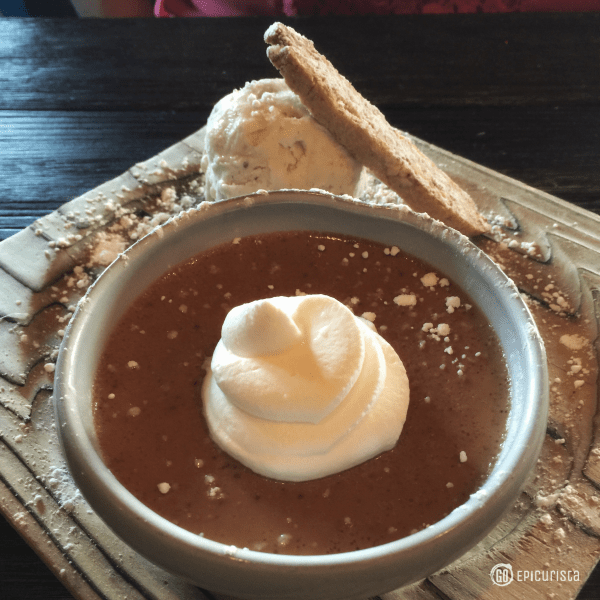 Wow a must try restaurant around orlando, Love the dishes it looks great and I want to try this. Thanks nice post! I always hesitate when it comes to sushi. Omakase sounds like the perfect solution! It drives me crazy when people without allergies insist on having a ton of changes to the menu.. It truly does make it very enjoyable to just sit back and enjoy what the chef puts in front of me. Thanks for checking out Go Epicurista! Wow, I haven’t even heard of this Orlando restaurant! It sounds like a great idea. However, those of us with food intolerances have such a horrible time with a set menu or surprise dining. If you can be carefree with what you choose, though, this sounds like an exciting date night! Kim, Dragonfly is worth checking out especially if you like sushi and creative Asian cuisine. Food intolerances do make dining out a bit harder but don’t be afraid to just talk to the chef, give him/her your list of dietary restrictions and then let their creativity take over. They are experts and often welcome the challenge. I don’t recommend doing this on a busy weekend so they can give you more attention. Do Omakase after your second visit when you can talk to the chef and know their style and whether it will meet your needs. But definitely, don’t miss out. Thanks for checking out Go Epicurista!